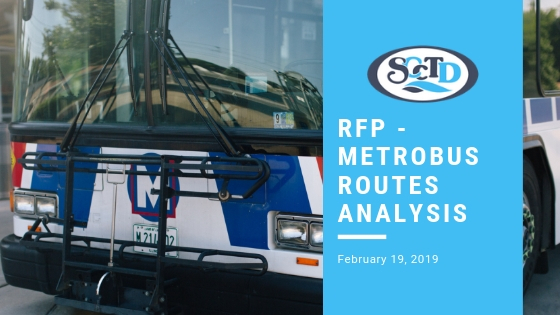 St. Clair County Transit District (SCCTD) is teaming up with Bi-State Development to do a comprehensive operational analysis of all 18 MetroBus routes in Southwestern Illinois. SCCTD and Bi-State issued an official Request for Proposals (RFP) on January 29 seeking technical assistance to conduct an operational assessment of the current MetroBus system, including recommendations for phased improvements, to make service more attractive, productive and efficient for residents of St. Clair County. “Our number one goal is to ensure that our transit system meet the needs of our residents in Southwestern Illinois. We have been working very hard to improve customer service, but a comprehensive look at our entire MetroBus system has not occurred in more than 2 decades. This analysis will allow SCCTD to improve service not only for our residents, but also for some of our major employers located in Southwestern Illinois,” said Ken Sharkey, Managing Director of the St. Clair County Transit District. Proposals for the RFP are due on February 19, 2019. SCCTD will be working closely with Bi-State Development on this project. Bi-State serves as the transit service provider for SCCTD which underwrites the service in Illinois. Bi-State recently wrapped up similar analysis on the Missouri side of the system with the Metro Re-Imagined Study. The goal is to have a consultant on board by April 2019 to begin the work. Information on the RFP is available here. Additionally, SCCTD is currently working to add several bus shelters along heavily utilized routes, adding new trash receptacles at O’Fallon bus stops through a partnership with the City of O’Fallon, recently underwrote new transit patrol vehicles in a partnership with St. Clair County Sheriff’s Department, and upgraded all ATS vehicles with new cameras.